鈞越國際有限公司 Genplus International Co., Ltd.
GENPLUS INTERNATIONAL CO., LTD. was established in 2008, also we are professional OEM manufacture for the auto lamp and relating products which included the LED headlamp, LED fog lamp, tail light and LED daytime running light series. 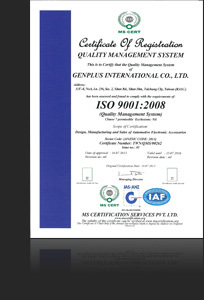 All products and our quality is made under ISO 9001 and TS16949 regulations strictly. With complete in-house production and testing facilities, we are proud of offering every headlamp to match customer requirement with excellent quality. Our main goal is devoted to innovate and serve the best quality of automobile related accessories. Based on our marketing experience in the auto field and our keen insight on the market, we're proud of providing the automotive accessories in safe, comfortable, popular, and practical and the best quality.